We went to a great baseball game tonight. The Angels beat the Tigers 12-2, and there was more great action in one game than I have seen in a long time. 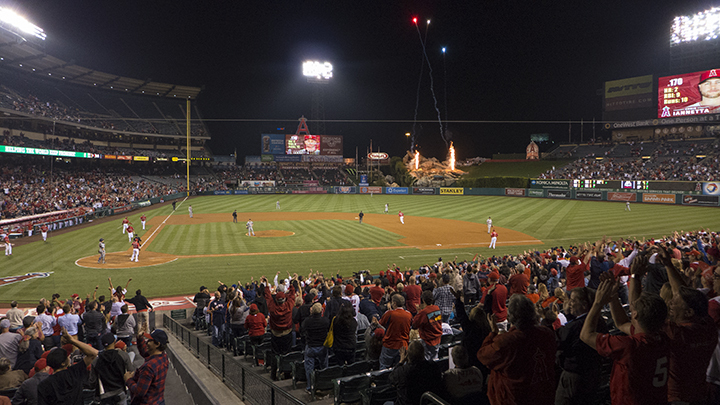 In addition to Chris Iannetta’s 7th inning grand slam (above; love the giant flames in center field), there was a triple (kind of rare), a run scored on a passed ball, a run scored on a walk, a successful suicide squeeze play, and a rundown with two players on third base for a time before the lead runner was thrown out returning to third. Great fun.